I had a few thoughts as to why this big drop in traffic might have occurred, and after a few minutes reviewing their analytics I had confirmed the reason for the drop. I am writing this post to make sure you don’t make the same simple mistake that these folks did, and lose a huge amount of hard-earned site visitors in the process. 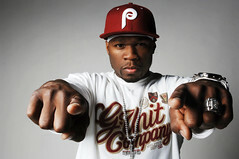 This is the rapper Fifty Cent. He won’t cause your website traffic to drop by fifty percent. But improper redirects after a site redesign just might. The traffic the site was getting from search engines – in particular Google – dropped by about 70% from the month before the relaunch. Their other sources of traffic had declined as well, but since Google search was the most significant source of traffic for the site, the majority of the drop in traffic was attributable to this loss of love from the Google search algorithm. What had happened? Why did they lose their Google Juice? Why Did Website Traffic Drop? The answer is simple: the web developers hadn’t properly redirected enough of their pages that were showing up in Google searches. When they took down their website and replaced it with their new one, many web page addresses changed, or the pages were removed entirely. People who came to their site from Google searches found a “Sorry, not found” error page instead of the page they were looking for. And when Google went to index the site to include it in search results, pages that had previously shown up had now disappeared, with no forwarding address. Of course, Google search works well enough that they won’t include non-existent pages in their search results. The drop in search traffic was almost immediate, as Google stopped including those pages in search results it showed people. If you are relaunching your website, you need to make sure your web developer properly ‘redirects’ the pages on your site, especially those that show up in search results often. In fact, if you are changing the web address or moving ANY pages on your site, it’s a good idea to do a proper redirect. What you’re doing is making sure that visitors who want to visit this great page they found in search results (or by following a link) are given a proper ‘forwarding address’. Think about how your mail is forwarded when you move. It’s no use to anyone who wants to get in touch with you to simply get a message that you no longer live there. They don’t want to get an error message. They want to have their messages forwarded to you directly. That’s how a proper redirection on a page that has been moved works for search engines and site visitors. It offers a seamless forwarding address that they are routed to, with no interruption in service. To go back to our ‘forwarding address’Â analogy, it’s the difference between a “return to sender” message on mail or seamless mail forwarding.Â Which do you set up when you change your address? Non-paid Search segment can be applied to all reports in Google Analytics to show traffic from search engines. To focus in on your traffic from search engines, log in to your account and on the ‘Reporting’ tab activate the segment called ‘Non-paid Search’. Learn about how to use segments here. Using this this segment helps you to look at visitors from search. Now visit Reporting > Behavior > Site Content > Landing Pages and see what pages search engines send people to on your site. Note: if you have already experienced a drop in traffic after a site redesign, you should set the time period for this report (top right corner) to a time before the site relaunch or drop in traffic. This landing pages report shows the entry points that people coming from search engines – Google, Bing, Yahoo – and are thus very likely to be the pages that show up most often in search. You need to keep a record of these popular landing pages, and more than just the ten Google Analytics shows you by default. Go to bottom of the table and choose “Show rows” and select a large number of rows to include in the report. Show more rows of data at the bottom of tables in Google Analytics. You want to share this report of popular search landing pages with your developer, so you will ‘Export’ the data in a format they can use. At to the top of the page, under the ‘Landing Pages‘ heading, click on the “Export” link. Save the list of landing pages as an Excel or CSV file to share with your web developer. Export any report in Google Analytics by clicking on the ‘Export’ button at the top left of the Reporting dashboard. 1. How old some of the pages are that are sending you traffic. Search engine results can get better over time if you’ve created good content, as more people link to those pages. 2. How long the list of pages is. If you have an older site, you may have thousands of pages getting one or two visits a month from search engines. This ‘long tail’ can end up contributing a lot of visitors over time. If you have a busy, big site with a lot of landing pages, it’s a good idea to export the same ‘Landing Pages’ report for the “All Visits” segment. In many cases, there will be a lot of overlap, but you don’t want to miss any important landing pages. Take the lists you have created above and give them to your website developer. Make sure they properly redirect these popular pages, using a 301 redirect. Make sure they understand not to use an ineffective 302 redirect or the dreaded 404 error message. Now your site visitors will have a seamless experience on your new website, and Google, Bing and Yahoo will retain their love for your content.Â Everyone wins. I started this post describing how an agency had neglected to put in the proper redirects to popular content, and their client’s site had lost a lot of traffic as a result. These folks were experienced developers who do great work, not a bunch of weekend WordPress warriors. They kept the same URLs for a significant number of pages on the relaunched site. A developer simply didn’t pay enough attention to their search traffic when migrating the site. This happens far more often than it should, even with a good website developer. So make sure you do this ‘dummy check’ for your most popular content if you are in the process of relaunching your site, or even if you are moving a few pages around on your site. You can’t afford to lose half of your website traffic, can you?Â If you have horror stories about drops in site traffic, with a website redesign or without, let me know in the comments below.Â Misery loves company.